We are happy to bring out the English version of Ausadha Yoga Vijnanam. This book is a boon for Post graduates of Ayurveda. 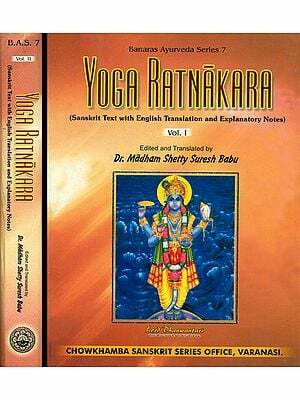 The book mainly deals with Ausadha Yoga, covers the Syllabus of M.D. 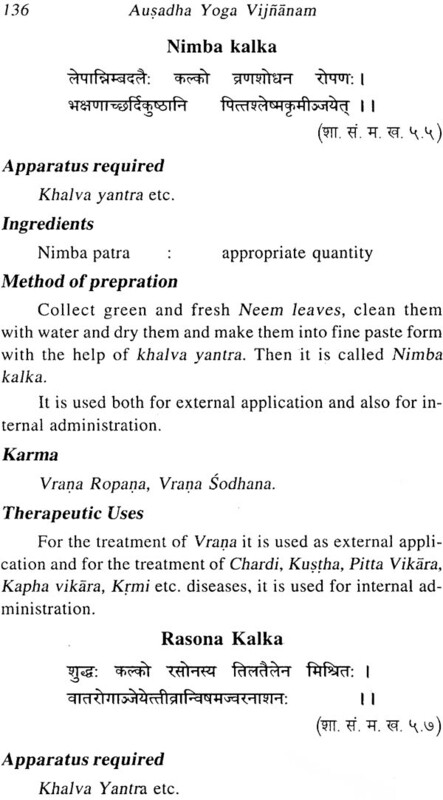 Rasasastra specialisation, Paper-Ill Ausadha Yoga Vigyan and M.D. 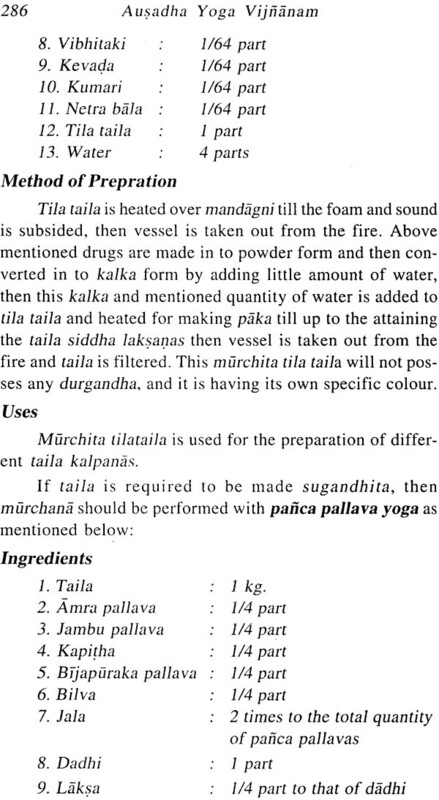 Bhaisajya kalpana specialisation, Paper-III Ausadha Yoga Vigyan. The basic fundamentals of Ausadha Yoga including reference, ingredients, method of preparation, therapeutic uses and dose etc. are explained in a nice manner in this book. This book also useful to the persons working in Ayurvedic Pharmacies for referring different Ausadha Yoga. Dr. Reddy tried to bring the more practical aspects of Ausadha Yoga with scientific explanation. The English version of this book will add new dimension to the popularity and the scope of this branch of knowledge in the era. Born in a small town Kavali in Nellore dist (Andhra Pradesh), in the family of traditional farmer, he gradually acquired highest degrees BAMS, M.D., Ph.D.. H.P.A.Edu.. 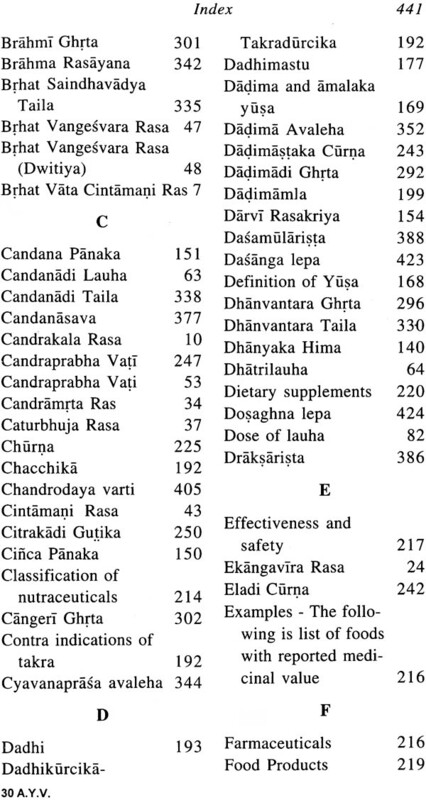 CLAD (JAPAN) in Ayurveda pertaining to Rasasastra and Bhaisajya KalpanãfromvariousUniversitiesoffndiaandAbroad.Sevenbooksandagoodnumber of research papers are published in the credit of Dr. K. Rama Chandra Reddy. Which are referred by BAMS, M.D. students of Ayurveda, Various research scholars and Persons working in Ayurvedic Drug Industries? Dr. K. Rama Chandra Reddy is well known for his valuable contribution in the field of Ayurveda, pertaining to Ayurvedic Pharmaceutics (Rasasastra and Bhaisajya Kalpan). During the last 14 years he has written on various aspects of Rasasastra and Bhaisajya Kalpan—Literary, scientific, conceptual as well as practical aspects of Ayurvedic drug manufacturing. 1-Ic is appointed as a Head for the Deptt. of Rasasastra and Bhaisajya Kalpan in NKJ Ayurvedic medical college, Bidar (Karnataka)and then he is appointed as a Head for the Dept. of Rasasastra and Bhaisajya Kalpana in S.D.M. College of Ayurveda, Hassan (Karnataka), further he is also worked as Asst. Professor & Manager- Pharmacy in National Institute of Ayurveda, Jaipur, at present he is working as Associate Professor, Deptt. Of Rasasastra& Superintendent, Ayurvedic Pharmacy, Faculty of Ayurveda, Institute of Medical Sciences, B.H.U.Varanasi. By working in various prestigious Universities in India and Abroad Dr. Reddy has acquired best knowledge of his concerned field. Dr. Reddy has been produced many Post Graduate thesis works and Ph.D.Thesis works. Dr. K. Rama Chandra Reddy has been awarded by the Vaidyaratna Capt. G. Srinivasa Murthy Scientist Award and Gold Medal by Academy of Ayurveda (A Research institute), Vijayawada, A.P. Further he is also awarded by the prestigious first national award Acharya Ratna by KAP Ltd., Kerla. 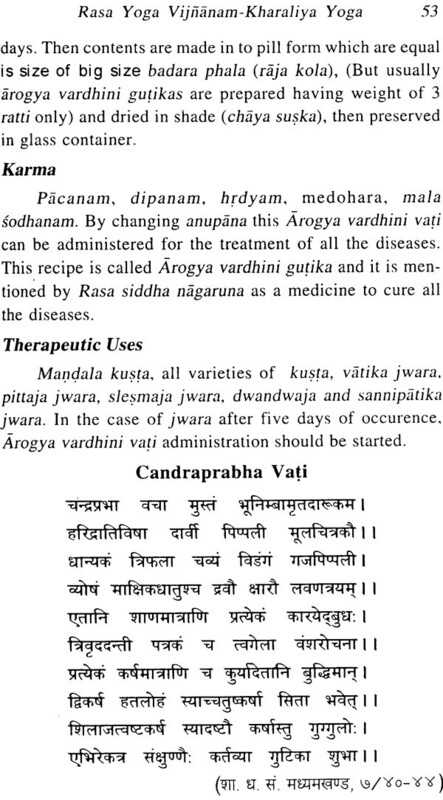 Origin of Ayurveda in India can be traced from Vedas. Ayurveda is the science of life, it is rapidly gaining global acceptability as a highly effective health care system. It is one of the most complex and intellectually challenging and demanding as medicine with the advancements and need of the hour. Today Ayurveda is receiving international attention. 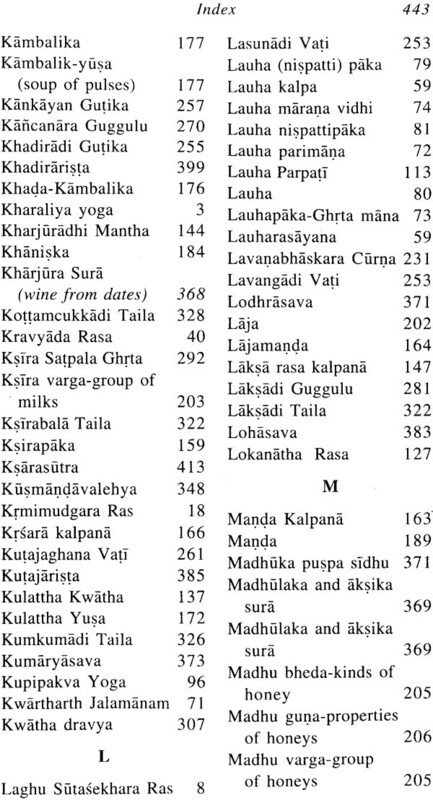 Large population in the country depends on the drugs of Ayurveda origin. Its extensive use of herbs, animal and mineral products, ensures a large extent, the production of safe medicines. It is necessary to mention the details of the formulations for the purpose of maintaining their quality, reproducibility and standardization. 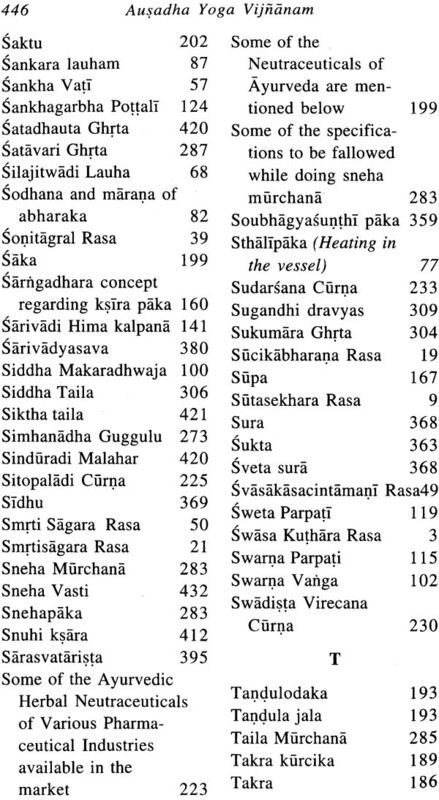 Hence it is necessary that more books should come in Ayurveda, as per requirement of the time, advances have to be made accordingly, without compromising the fundamentals of ancient knowledge, new concepts may be introduced to enrich the science as well as to contribute to current health care challenges. Rasa Shastra and Bhaishajya kalpana is one of the important branch of Ayurveda, which deals with Ayurvedic drug manufacturing. 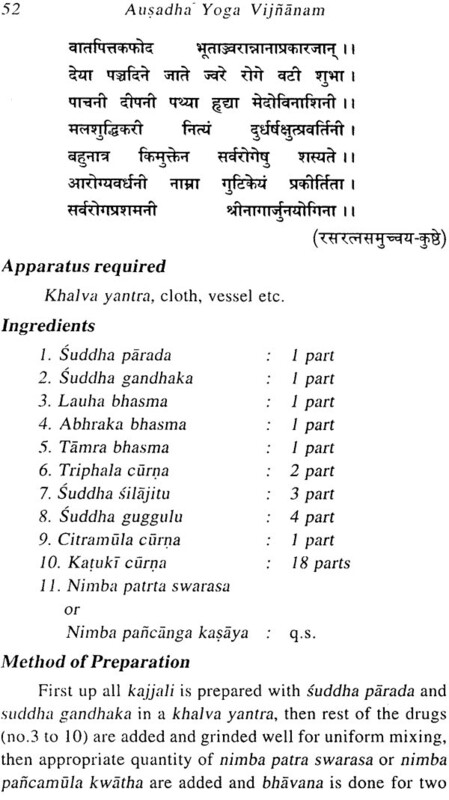 In this context Aushadhayoga vignanam written by Dr.K.R.C.Reddy, which deals with many number of compound formulations of Ayurveda includes the details of reference sloka, ingredients with their quantity , method of preparation, Dose, Therapeutic uses, Anupana (Vehicle) etc. The book is written as per the syllabus of Central Council of Indian Medicine (CCIM), New Delhi, prescribed for both specializations of M.D. Rasa Shastra and M.D. Bhaishajya Kalpana. As the subject matter is incorporated on the basis of syllabus and the book contains formulae of many famous Ayurvedic formulations made by pant, animal and mineral materials. Hence, I am sure this book will soon become very popular in the Postgraduate students of Ayurveda and persons engaged in the Ayurvedic drug manufacturing. I wish the author to have a bright future. I feel immense pleasure to write foreword for the book entitled Aushadhayoga vijnanam written by Dr. K. Rama Chandra Reddy. 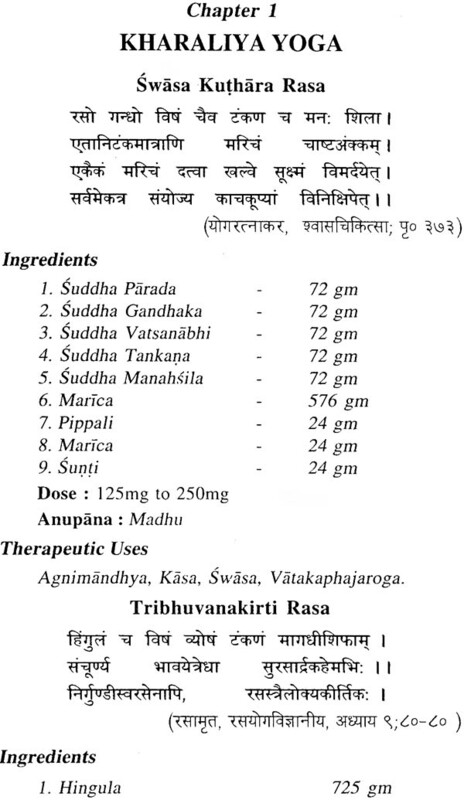 The Ayurveda drugs are obtained from natural source only i.e. from plants, animals and minerals. 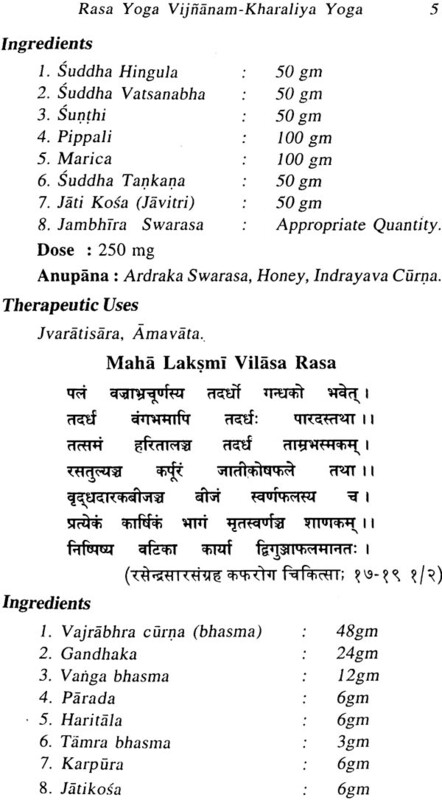 Ayurvedic compound formulations are divided into two group’s viz. 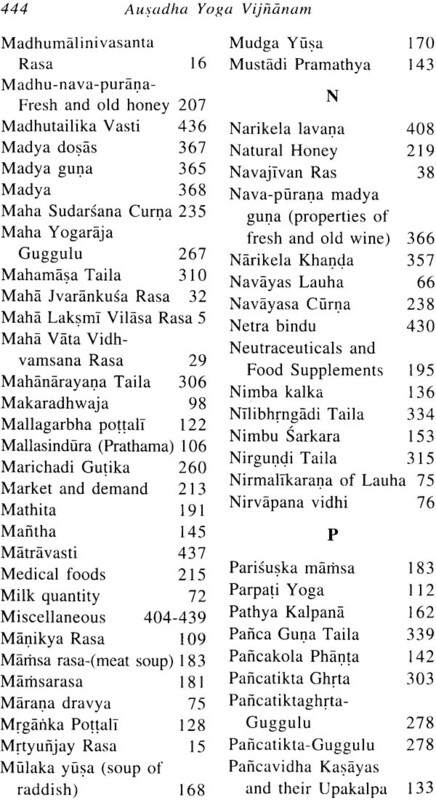 l. Rasaushadhi (Predominantly metals and minerals are used for preparation and mainly dealt in Rasa Shastra). 2. 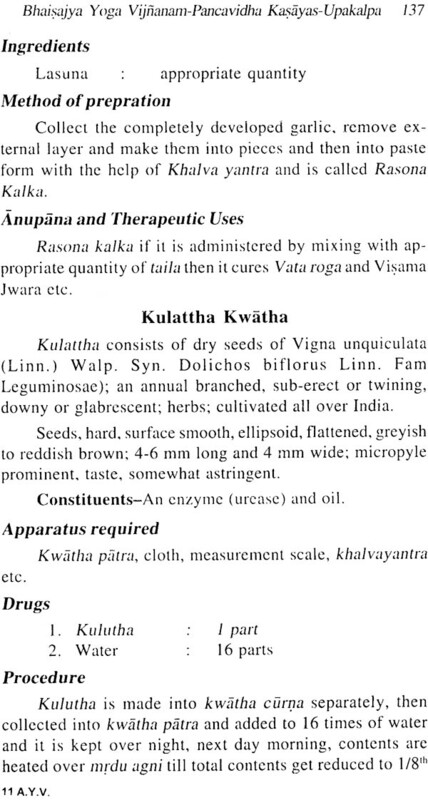 Kashtaushadhi (Predominantly plant drugs are used for preparation and mainly dealt in Bhaishajya Kalpana). 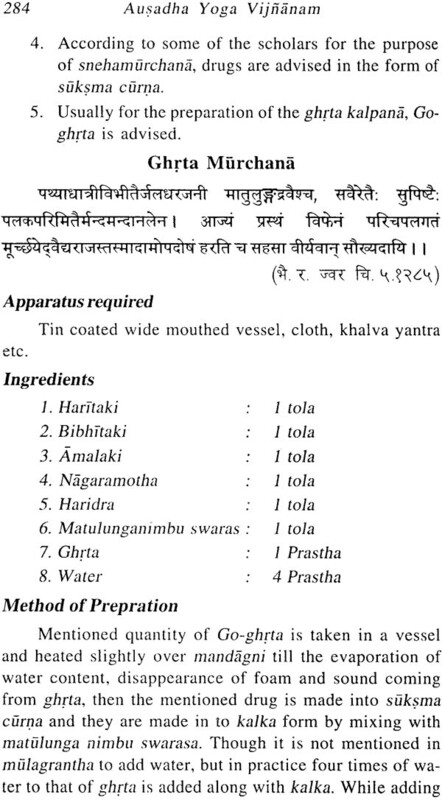 This book includes the details of reference sloka, ingredients with their quantity, method of preparation, Dose, Therapeutic uses, Anupana (Vehicle) etc. 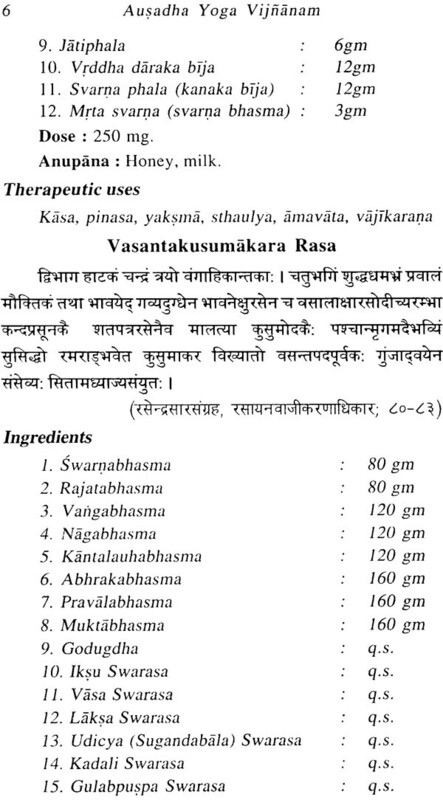 of several categories of Rasaushadhi formulations such as Kharaliya yoga, Loha kalpa, Kupipakwa yoga, Parpati yoga, Pottali yoga etc. which are described as Rasa Yoga and several categories of Kashtaushadhi formulations such as Churna, Avaleha, Taila, Asavarishta etc. which are described as Bhaishajya Yoga. Aushadhayoga vijnanam written by Dr. K.R.C. Reddy, which includes all the compound formulation, mentioned in Paper-III, of both specialization of M.D. 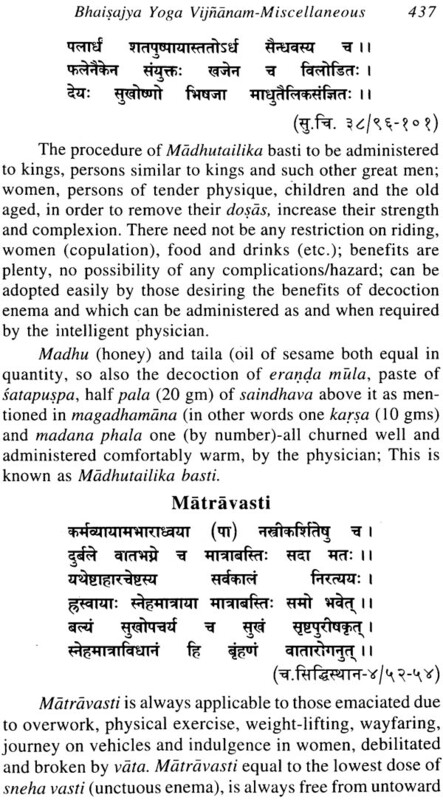 Rasa Shastra and M.D. 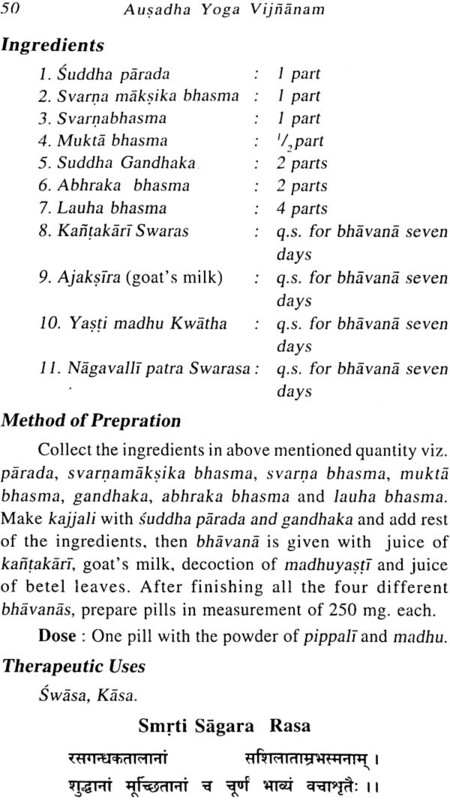 Bhaishajya Kalpana syllabus prescribed by Central council of Indian Medicine (CCIM), New Delhi. I believe that, the readers will find the study of this book is useful and satisfying. Hence, I am sure that, this edition will definitely find wider popularity among the Postgraduate students of Rasa Shastra and Bhaishajya Kalpana specialization and persons engaged in the Ayurvedic drug manufacturing. I bless the author for his prosperity in life ahead. I am happy to bring out the English Version of Ausadha Yoga Vijnanam. I have ventured to write this book which covers the syllabus of M.D. 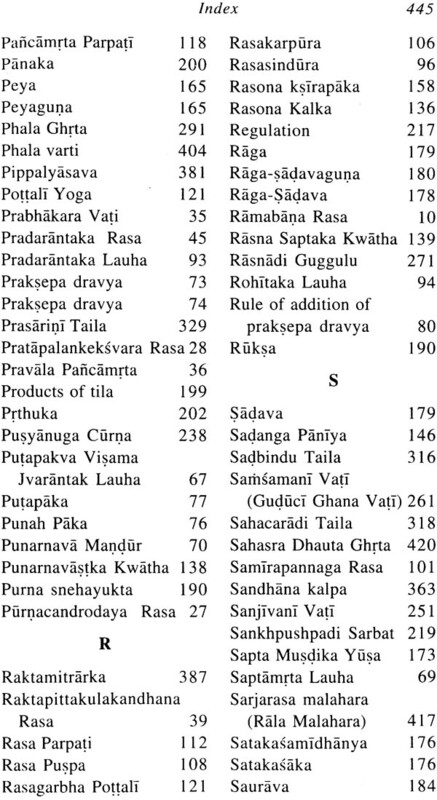 Rasasastra specialisation, Pa- per-HI, Ausadha Yoga Vigyan and M.D. 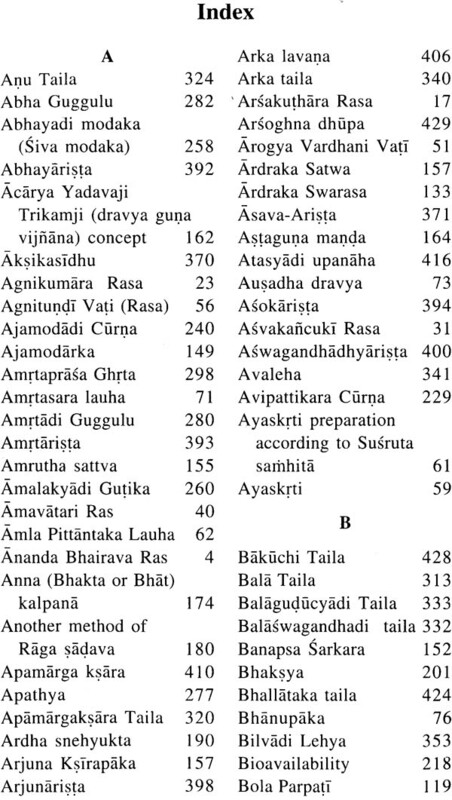 Bhaisajya kalpana specialisation, Paper-Ill, Ausadha Yoga Vigyan. The vast majority of the population in the country depend on drugs of indigenous origin. It is, therefore necessary that, more books should come out in this subject. 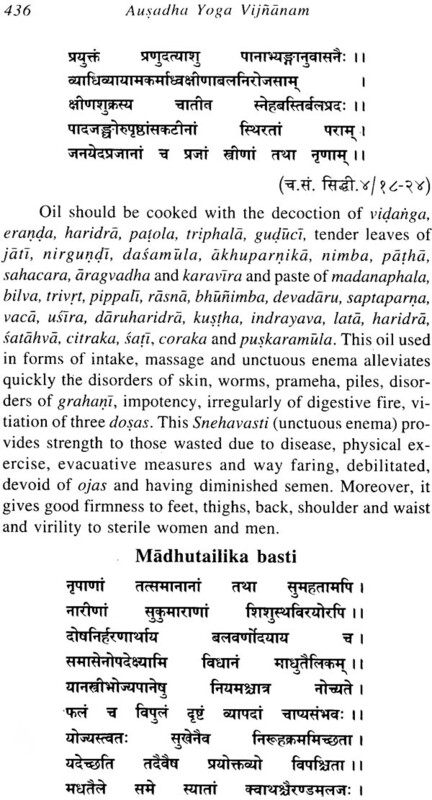 Collection of literature related to Rasa Sastra and Bhaisajya Kalpana helps for producing good quality of Ayurvedic medicine. 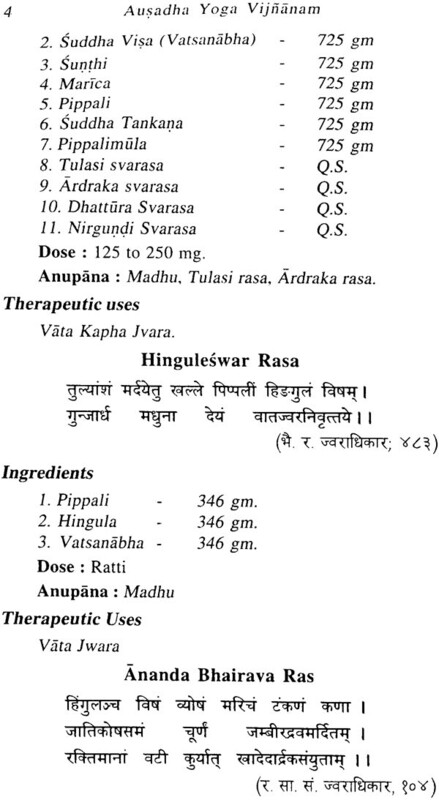 Ayurvedic compound formulations are divided into two groups viz. 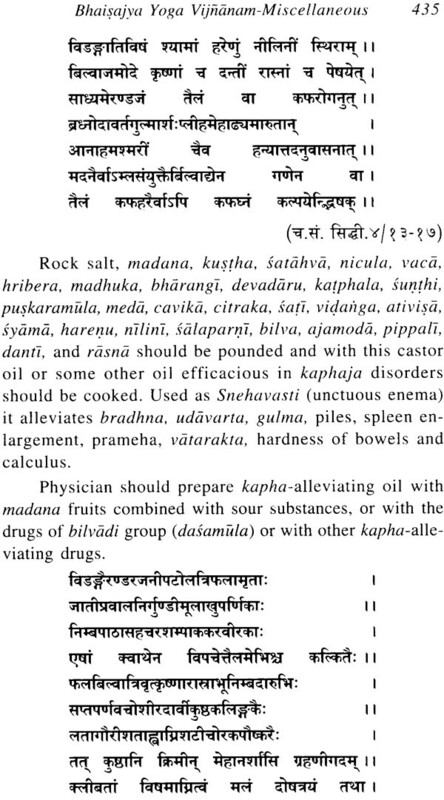 a) Kastausadhi (Predominantly made with plant K drugs) dealt in Bhaisajya Kalpana. 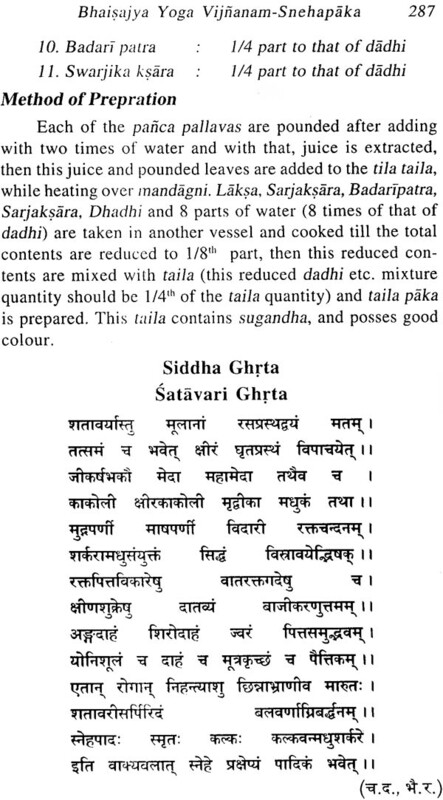 b) Rasausadhi (predominantly made with metals and minerals) dealt in ` Rasasastra. The present publication of Ausadha Yoga Vijnanam, deals with different aspects of Ausadha Yoga. 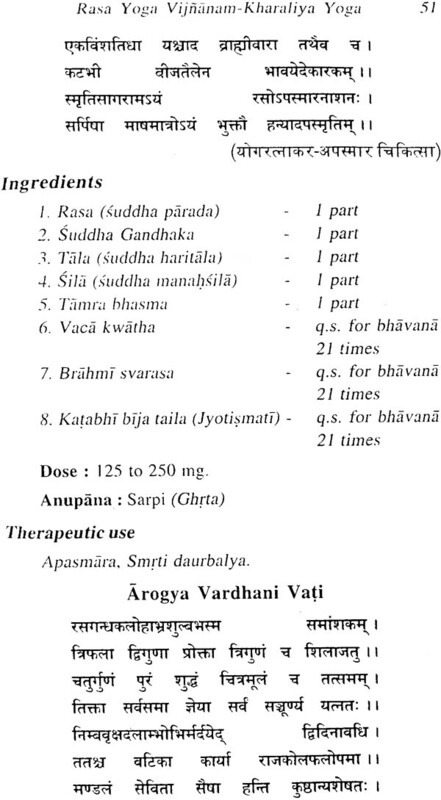 A The Ausadha Yoga Vijnanam has however includes the most commonly accepted formulae for the medicinal preparations. 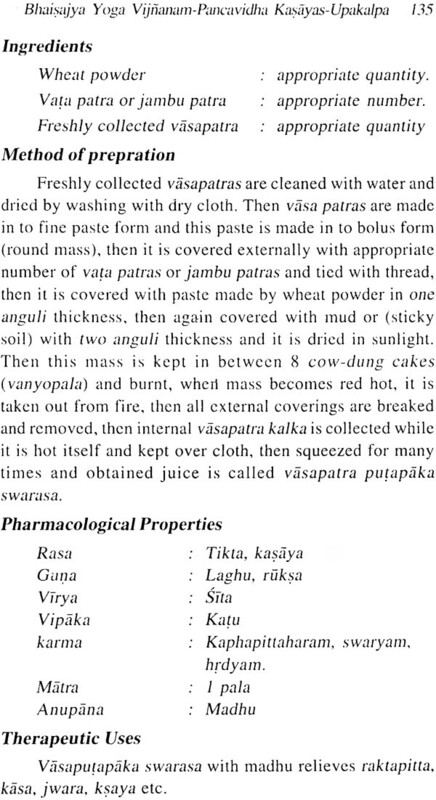 I have tried to bring the subject of Rasa Sastra and Bhaisajya Kalpana in relation to formulations in a lucid language and by incorporating all the corriculum and syllabus of the subject given by Central Council of Indian Medicine. l have covered about many important formulae as examples and given the complete details including the practical ways of over coming the difficulties wherever found out. 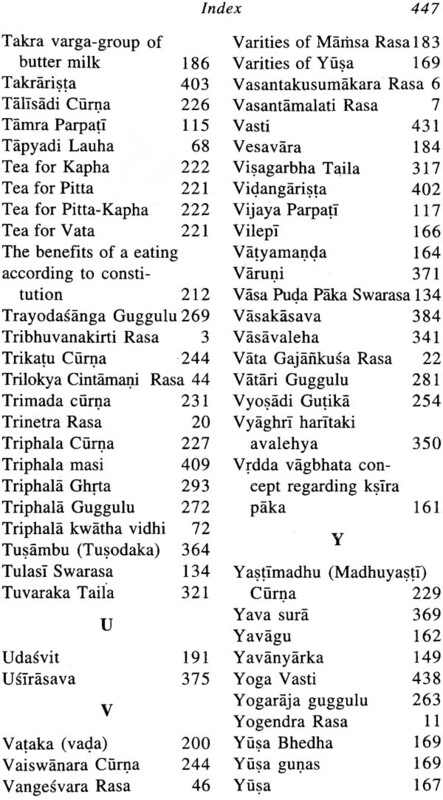 Though the matter related to formulations available in other books of Rasa Sastra and Bhaisajya Kalpana but it is in a scattered form. Keeping in view of the difficulties faced by students to bring up this compellition work of Rasa yoga & Bhaisajya yoga, by filtering, probing, piercing and extracting the essence of Ayurvedic standard books. In Present work all the information is collected at one place, codified and arranged in a systematic way, being spelled under suitable relevant headings. Thus this work deals with all the relevant and important aspects of Rasausadhi and Kastausadhi. In this treatise all those medicines are brought in to respective sections with wide range information of their pharmaceutical process. The book is designed according to the sequence of the C.C.I.M. New syllabus. Most of the commonly using formulae of Ayurveda are described with their method of preparation, dosage and indications etc. Every attempt has been made to include, as many important formulations as they are currently manufactured on a large scale in terms of value and practiced throughout the country. 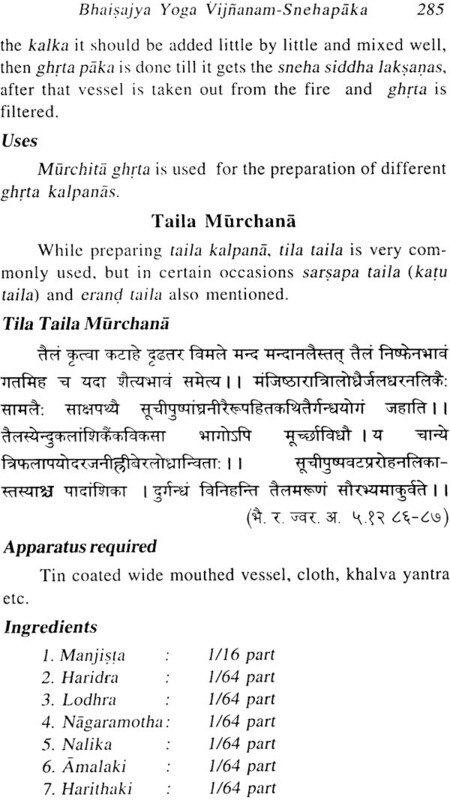 Though this book is written in English language, the technical terms of Rasa §5stra and Bhaisajya Kalpana are written in Sanskrit pronunciation only. It is hoped that, this book will find a wider reading public. The object of writing this book is that, M.D. 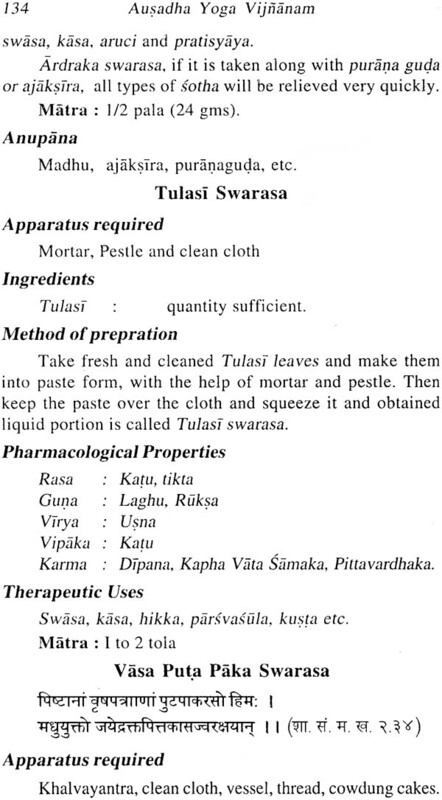 students, Ayurvedic Physicians, Pharmaceutical personnel and other interested in the preparation of Ayurvedic medicines, may understand better form of this book. 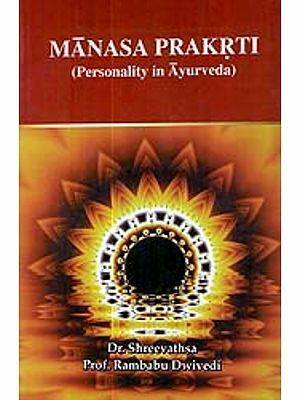 The readers may get the equalent modern pharmaceutical terminology for Ayurvedic technical terms with their elaborate information, which is necessary for understanding of Rasa yoga & Bhaisajya yoga up to some extent. 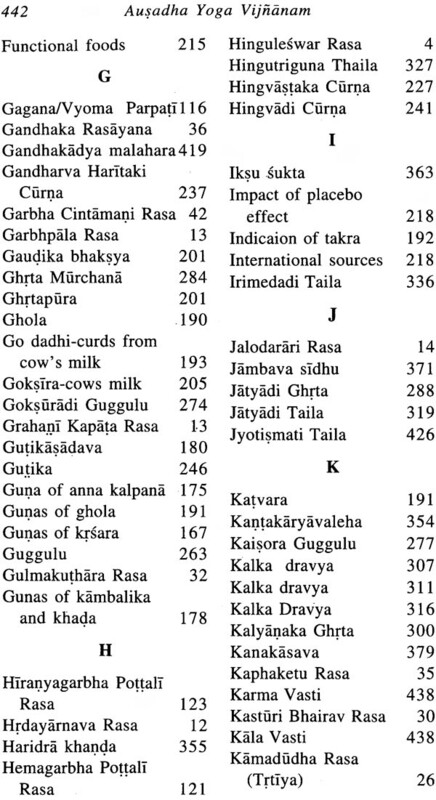 I am sure this book will be useful at large to the Ayurvedic students, Ayurvedic Pharmacists, Practitioners as well as to the drag administration department of the Indigenous systems of medicine. If any body finds mistakes in this book. I welcome whole heartedly lot their positive suggestions and obliged. I convey my deep sense of gratitude to my respected teachers specially Prof. T.M. Mohapatra, Director, I.M.S., B.H.U., Prof. V.K. Joshi, Dean, Faculty of Ayurveda, I.M.S., B.H.U., Prof. Damodar Joshi, Formerly Head, Department of Rasasastra, I.M.S., B.H.U., Prof. S.K. Dixit, Formerly Head, Department of Rasasastra, I.M.S., B.H.U., Prof. C.B. Jha, Formerly Head, Department of Rasasastra, I.M.S., B.H.U., Prof. L.K. Dwivedi, Head, Department of Rasasastra, N.I.A , Jaipur. I am also thankful to my collegues to Dr. Neeraj Kumar, Head, Dept. of Rasa Shastra, Faculty of Ayurveda, I.M.S., B.H.U. and Dr. A.K. Chowdhary, Dept. of Rasa Shastra, Faculty of Ayurveda, I.M.S., B.H.U. I am highly obliged to Sri Brajendra Kumar, Chaukhambha Sanskrit Bhawan, for undertaking the publication of this work. Prayers are offered to all those sages whose works are the basis of this book and also at the last feet of almighty for providing courage and wisdom to complete this work.